It is uncertain whether this form was once only or twice delivered by Christ to his disciples. 429"Il est incertain si Christ a enseigne ceste formule de prier a ses disciples une fois seulement, ou bien par deux diverses fois.” — “It is uncertain if Christ taught this form of prayer to his disciples once only, or rather at two separate times.” Some think that the latter is more probable; because Luke says that he was requested to do it, while Matthew represents him as teaching it of his own accord. But as we have said, that Matthew collects all the leading points of doctrine, in order that the whole amount of them may be more clearly perceived by the readers when they are placed in close succession, it is possible that Matthew may have omitted to mention the occasion which is related by Luke. On this subject, however, I am unwilling to debate with any person. Luke 11:1 As John also taught his diciples. John delivered to his disciples a particular form of prayer; and he did so, in my opinion, because the time required it. The state of affairs among the Jews was, at that time, exceedingly corrupted. Every thing connected with religion had so miserably fallen, that we need not be surprised to find few among them, by whom prayer was offered in a proper manner. 430 “Il ne se faut pas fort esbahir si la vraye et pure maniere de prier estoit pratiquee par bien peu de gens.” — “We ought not to be greatly surprised, if the true and pure manner of praying was practiced by very few people.” Besides, it was proper, that the minds of believers should be excited, by prayer, to hope and desire the promised redemption, which was at hand. John might, therefore, have collected, out of various passages of Scripture, a certain prayer adapted to the time, and approaching more nearly to the spiritual kingdom of Christ, which had already begun to be revealed. Matthew 6:9 Do ye therefore pray thus Instead of this Luke says, when ye pray, say: though Christ does not enjoin his people to pray in a prepared form of words, 431 “Combien Christ ne commande pas aux siens en priant de s'attacher scrupuleusement a certains mots;” — “though Christ does not command his people to adhere scrupulously to certain words. but only points out what ought to be the object of all our wishes and prayers. He embraces, therefore, in six petitions what we are at liberty to ask from God. Nothing is more advantageous to us than such instruction. Though this is the most important exercise of piety, yet in forming our prayers, and regulating our wishes, all our senses fail us. No man will pray aright, unless his lips and heart shall be directed by the Heavenly Master. 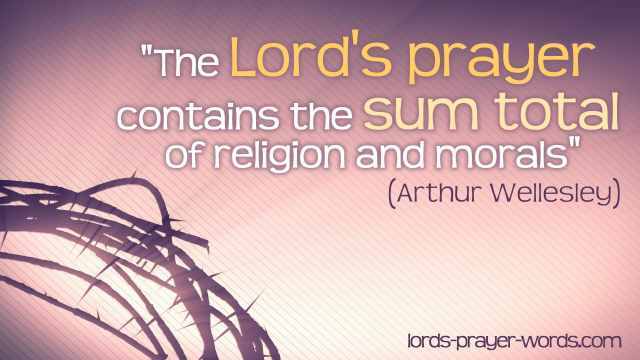 For that purpose he has laid down this rule, by which we must frame our prayers, if we desire to have them accounted lawful and approved by God. It was not the intention of the Son of God, (as we have already said), to prescribe the words which we must use, so as not to leave us at liberty to depart from the form which he has dictated. His intention rather was, to guide and restrain our wishes, that they might not go beyond those limits and hence we infer, that the rule which he has given us for praying aright relates not to the words, but to the things themselves. This form of prayer consists, as I have said, of six petitions. The first three, it ought to be known, relate to the glory of God, without any regard to ourselves; and the remaining three relate to those things which are necessary for our salvation. As the law of God is divided into two tables, of which the former contains the duties of piety, and the latter the duties of charity, 432 “Comme la Loy de Dieu est divisee en deux Tables, desquelles la premiere contient les choses dont nous sommes redevables a Dieu pour honorer sa majeste: la seconde ce que nous devons a nostre prochain selon charite.” — “As the Law of God is divided into two Tables, of which the first contains the things which we owe to God to honor his majesty: the second, what we owe to our neighbor according to charity.” so in prayer Christ enjoins us to consider and seek the glory of God, and, at the same time, permits us to consult our own interests. Let us therefore know, that we shall be in a state of mind for praying in a right manner, if we not only are in earnest about ourselves and our own advantage, but assign the first place to the glory of God: for it would be altogether preposterous to mind only what belongs to ourselves, and to disregard the kingdom of God, which is of far greater importance. Our Father who art in heaven Whenever we engage in prayer, there are two things to be considered, both that we may have access to God, and that we may rely on Him with full and unshaken confidence: his fatherly love toward us, and his boundless power. Let us therefore entertain no doubt, that God is willing to receive us graciously, that he is ready to listen to our prayers, — in a word, that of Himself he is disposed to aid us. Father is the appellation given to him; and under this title Christ supplies us with sufficiently copious materials for confidence. But as it is only the half of our reliance that is founded on the goodness of God, in the next clause, who art in heaven, he gives us a lofty idea of the power of God. When the Scripture says, that God is in heaven, the meaning is, that all things are subject to his dominions, — that the world, and everything in it, is held by his hand, — that his power is everywhere diffused, — that all things are arranged by his providence. David says, “He that dwelleth in the heavens shall laugh at them,” (Psalm 2:4); and again, “Our God is in heaven: he hath done whatever he hath pleased,” (Psalm 115:3). When God is said to be in heaven, we must not suppose that he dwells only there; but, on the contrary, must hold what is said in another passage, that “the heavens of heavens do not contain him,” (2 Chronicles 2:6). This mode of expression separates him from the rank of creatures, and reminds us that, when we think of him, we ought not to form any low or earthly conceptions: for he is higher than the whole world. We have now ascertained the design of Christ. In the commencement of the prayer, he desired his own people to rest their confidence on the goodness and power of God; because, unless our prayers are founded on faith, they will be of no advantage. Now, as it would be the folly and madness of presumption, to call God our Father, except on the ground that, through our union to the body of Christ, we are acknowledged as his children, we conclude, that there is no other way of praying aright, but by approaching God with reliance on the Mediator. May thy name be sanctified This makes still more manifest what I have said, that in the first three petitions we ought to lose sight of ourselves, and seek the glory of God: not that it is separated from our salvation, but that the majesty of God ought to be greatly preferred by us to every other object of solicitude. It is of unspeakable advantage to us that God reigns, and that he receives the honor which is due to him: but no man has a sufficiently earnest desire to promote the glory of God, unless (so to speak) he forgets himself, and raises his mind to seek God’s exalted greatness. There is a close connection and resemblance between those three petitions. The sanctification of the name of God is always connected with his kingdom; and the most important part of his kingdom lies in his will being done. Whoever considers how cold and negligent we are in desiring the greatest of those blessings for which we are here commanded to pray, will acknowledge that nothing here is superfluous, but that it is proper that the three petitions should be thus distinguished. To sanctify the name of God means nothing else, than to give unto the Lord the glory due unto his name, so that men may never think or speak of him but with the deepest veneration. The opposite of this is the profanation of the name of God, which takes place, when men either speak disrespectfully of the divine majesty, or at least without that reverence which they ought to feel. Now, the glory, by which it is sanctified, flows and results from the acknowledgments made by men as to the wisdom, goodness, righteousness, power, and all the other attributes of God. For holiness always dwells, and permanently remains, in God: but men obscure it by their malice and depravity, or dishonor and pollute it by sacrilegious contempt. The substance of this petition is, that the glory of God may shine in the world, and may be duly acknowledged by men. But religion is in its highest purity and rigour, when men believe, that whatever proceeds from God is right and proper, full of righteousness and wisdom: for the consequence is, that they embrace his word with the obedience of faith, and approve of all his ordinances and works. That faith which we yield to the word of God is, so to speak, our subscription, 433 “Comme si nous signions de nostre propre main, declarans que Dieu est veritable;” — “as if we signed with our own hand, declaring that God is true.” by which we “set to our seal that God is faithful,” (John 3:33) as the highest dishonor that can be done to him is unbelief and contempt of his word. We now see, what wickedness is displayed by most men in judging of the works of God, and how freely they allow themselves to indulge in censure. If any of us are chastised, they grumble, and murmur, and complain, and some break out into open blasphemies: if he does not grant our wishes, we think that he is not sufficiently kind to us. 434 “Il nous semble qu'il nous fait tort;” — “we think that he wrongs us.” Many turn into matter of idle talk and jesting his incomprehensible providence and secret judgments. Even his holy and sacred name is often treated with the grossest mockery. In short, a part of the world profane his holiness to the utmost of their power. We need not then wonder, if we are commanded to ask, in the first place, that the reverence which is due to it may be given by the world. Besides, this is no small honor done to us, when God recommends to us the advancement of his glory.